Arsenal were generously represented at the inaugural Facebook Football Awards this year, with the north London club scooping four of the prizes on offer. Chilean forward Alexis Sanchez, who has starred in his first season in the Premier League since joining from Barcelona last summer, claimed the Player of the Year gong as well as the Content of the Year award for his impressive dribbling skills in a pre-match warm-up at the Emirates Stadium. 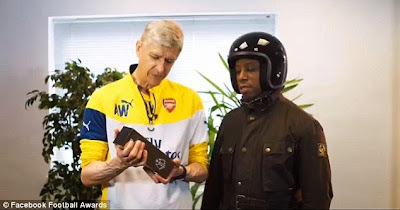 Gunners boss Arsene Wenger, meanwhile, was named Manager of the Year, after guiding his side to a third-placed finish in the league as well as to the FA Cup final against Aston Villa. Arsenal also claimed the overall Club of the Year award. 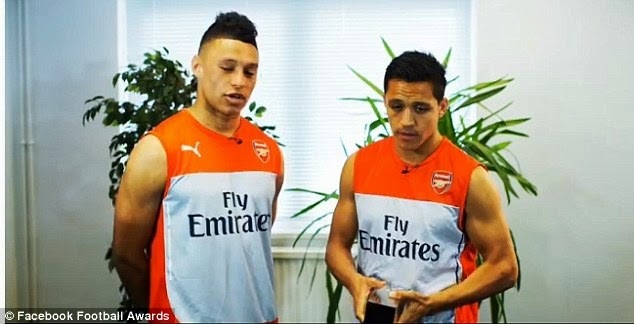 Sanchez, who like many of the winners, decided to accept his prize via video instead of attending the ceremony at the Queen Elizabeth Olympic Park in London, was presented his trophy by team-mate Alex Oxlade-Chamberlain. Reflecting on a productive debut season in England, Sanchez said that a personal highlight was his goal against Manchester City in September's 2-2 draw. Tottenham striker Harry Kane won the Young Player of the Year award and also accepted it via video, receiving it from Wales rugby captain Sam Warburton. Asked what his highlight of the season was, Kane chose scoring the winner against Arsenal in the north London derby. He added that Chelsea centre back John Terry was 'world class' and the toughest defender he had played against this term.